Performs a wipe transition between two input clips using a pattern of growing or shrinking hexagons, triangles, diamonds, or stars. The Wipe Percent parameter should be animated to control the transition speed. Increase the Grad Add parameter to make the timing of the tile pattern move across the screen during the wipe. Increase the Border Width parameter to draw a border at the wipe transition edges. Tile Shapes: Popup menu, Default: Hexagons . The tile shapes used to generate the pattern. Note that the Morph Shapes parameter can transform the shapes away from this setting. 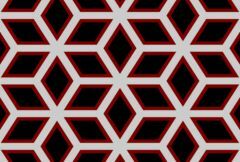 Stars: Six-pointed stars merge to make a pattern of squares. Shapes Dir: Popup menu, Default: Grow . The direction of change of the tile sizes. Shrink: the tiles start large and shrink inwards. Grow: the tiles start small and grow outwards. The rotation of the overall tiles pattern used for the wipe, in degrees. The frequency of the tiles pattern. Increase for more and smaller elements, or decrease for fewer and larger. The relative horizontal size of the tiles. Increase for wider tiles, decrease for taller ones. The relative size of the tiles in the direction of the current rotation angle. If the Angle parameter is zero this will have the same effect as Rel Width. Translation of the tiles pattern. The angle in degrees to rotate the sides of the shapes. This can be used to transform one shape into another, or generate new different tile patterns.